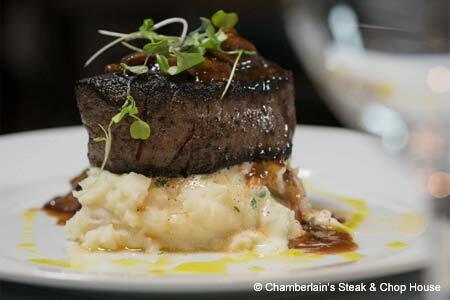 Chef Richard Chamberlain satisfies the finicky steak fans of Dallas. : The atmosphere has its nostalgic appeal yet could use just enough updating to not scare off the Prestonwood golfer who’s made this joint his 19th hole since the early ’90s. On a hot or cold day, the BLT iceberg salad is a good starter, drizzled with blue cheese and laced with bacon, tomatoes and onions. The sea scallop and colossal shrimp with apple wood bacon brochette balances flavors both rich and mild. A filet never disappoints, whether it’s Kobe sirloin or simple cuts complemented by a portobello mushroom stuffing. A side dish that tends to outshine the main attraction, however, is the creamed corn with apple wood bacon; this dish swims with savory butter, diced onions and rich, thick bacon. For a light night of food and entertainment, sit at the bar with a five-ounce filet and a glass of French wine and people-watch---it’s a true taste of Dallas life.